Filled with sparkling new Gotham-related originals and several equally pertinent standards, New New York is Slagle's fully realized, multi-faceted tribute to the ebullient city he loves. Slagle, veteran of the Carla Bley and Charles Mingus bands and featured sideman with Joe Lovano, presents a striking musical journey around the city that Slagle has called home for twenty years. From landmarks including the Hudson River and Times Square to venues such as West Side lofts, the Bowery and Brooklyn, to icons of jazz's Mecca such as Thelonious Monk, Charles Mingus and Ed Blackwell, New New York paints a sometimes reflective, sometimes explosive, sometimes sensual portrait of New York City. Long-time colleagues (and fellow New York dues-payers) tenor sax superstar Joe Lovano and vibraphone wizard Joe Locke personalize Slagle's portrait. 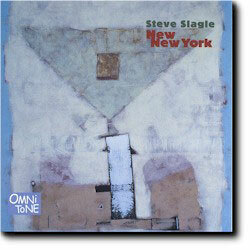 All compositions by Steve Slagle, Slagle Music/BMI, except as noted. Recorded 20-21 June 2000 at The Studio, New York.